We had stayed up a bit late enjoying the music and dancing the night before so on the morning of Sunday, 26-August we slept in, then had a lazy, relaxing morning on the boat. Rick did mix in a little troubleshooting of the fly bridge thruster controls – they had been showing an annoying tendency to stick, which in close quarters could be a little stressful; after tightening some connectors and spraying a little CRC electrical cleaner around they seemed to be behaving better. We grabbed an early lunch at the nearby Smokehouse restaurant and then walked along the riverfront over to the Nauticus maritime and naval museum. (LINK.) 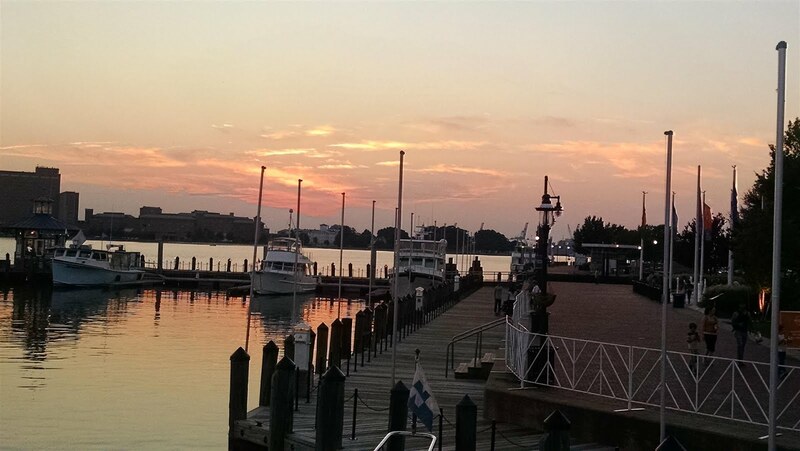 It is a fabulous place to learn about the rich nautical history not only of Norfolk, but also of Portsmouth and Hampton Roads, from the early settlement days all the way to today’s period, where it is now home to the world’s largest naval base. In between it was a pivotal battleground and control point for naval activities during the Revolutionary and Civil Wars, and later grew to prominence for the U.S. Navy’s critical role during World Wars I and II. We spent several hours in the museum complex and still didn’t see everything. 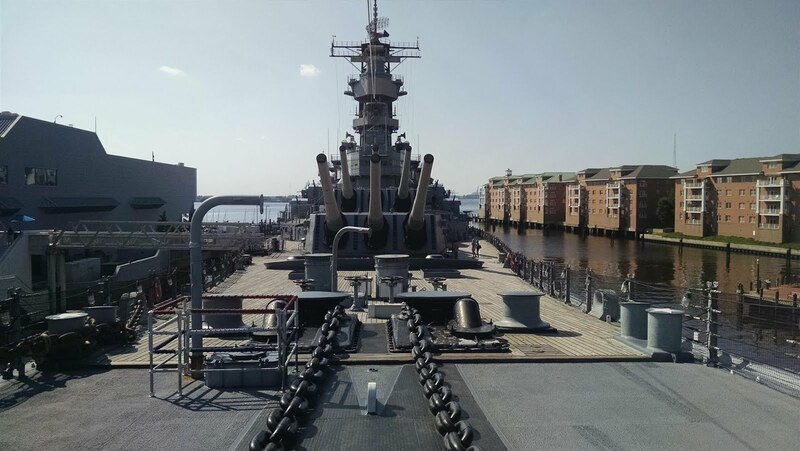 One of the highlights is getting aboard the battleship USS Wisconsin, BB64, nicknamed Wisky, originally commissioned two years after the attack on Pearl Harbor, thence serving up through the first Gulf War in 1991. At 887 feet long and a beam over 100 feet, it takes a while just to walk down its decks, which by the way are all teak. Each of its nine 16 inch diameter guns could launch a 2700 pound projectile accurately to a target 23 nautical miles distant….which is like firing a Volkswagen Beetle from Dallas to Fort Worth. It was the last of the dreadnoughts….in today's world nuclear powered aircraft carriers are now the Navy's flagships roaming the world’s oceans. 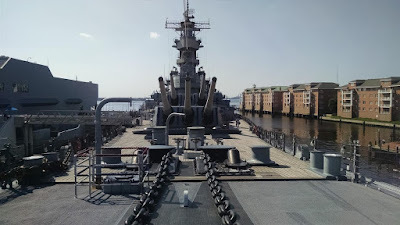 The Nauticus experience spurred us to further explore the naval yards the following day, Monday, 27-August, with a two hour trek onboard the tour ship Victory Rover. 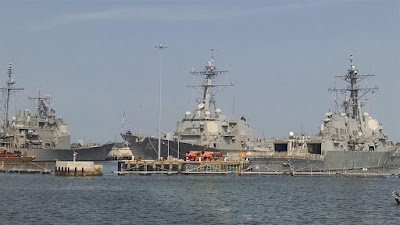 The narrated cruise took us across and then up the Elizabeth River, passing numerous repair and depot boat yards, and about every kind of ship that the U.S. Navy has in its inventory. That included close passes near carriers, guided missile cruisers, Arleigh Burke destroyers, several different types of supply and cargo vessels, and even the hospital ship, USS Comfort. It was quite impressive and informative, and certainly well worth the time. On Tuesday, 28-August we got back underway just before 0900. 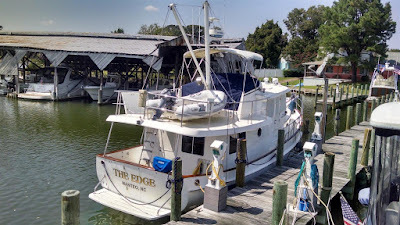 The tight pivot in the marina basin was uneventful as the thruster controls on the fly bridge were behaving themselves after Rick had cleaned and tightened some connections. 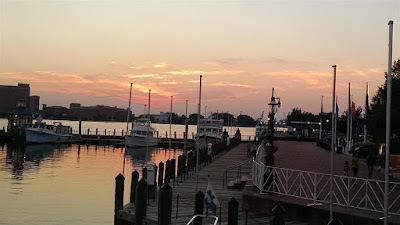 We headed Ghost Rider up the Elizabeth River past all the naval yards towards Chesapeake Bay. 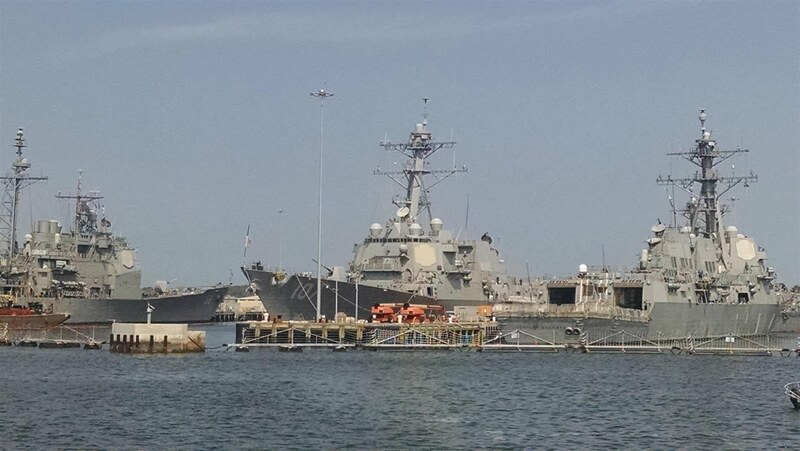 The Navy was active this morning as a few Arleigh Burke class missile destroyers set sail just ahead of us, and then about an hour later an aircraft carrier did the same. Their patrol boats were active on the VHF radio letting everyone know the lateral distance the security zones required. One recreational boat wasn’t getting the message at first, but apparently the threat to open fire finally got the helmsman’s attention and the drama settled down. As the river joined the bay we ran into a healthy incoming current and slowed to below six knots for a spell. 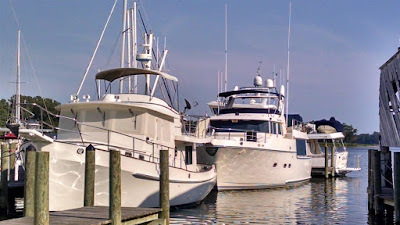 But by the time we turned north into the Chesapeake we had a following current and we cruised the rest of the day at 8+ knots at an easy 1400 RPM. Both boat traffic and winds were light and it got hot, into the upper 90’s by mid-afternoon. 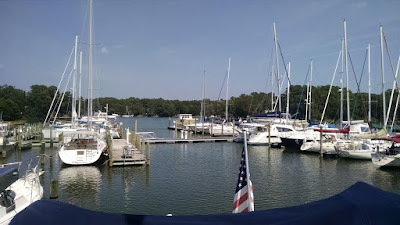 The bay waters, however, were quite smooth, so it was a pleasant ride up past the Rappahannock River and then WNW up Indian Creek and to the Chesapeake Boat Basin Marina. Their facilities are a bit cramped there, but they had a deep entry channel and just enough room for our boat on the outside t-dock. We docked up there around 1640, and there to greet us was good friend Billy Edge, who had his Kadey-Krogen 39, The Edge, docked there as well. 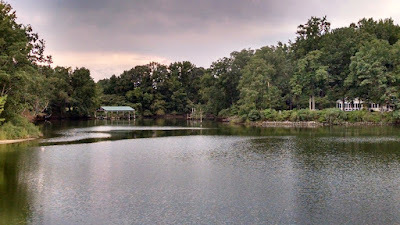 After we got ourselves and Ghost Rider washed down, Billy escorted us to a first class dinner at the Tides Inn located on the upstream shores of the Rappahannock River. The food, drinks and company kept were excellent. The first half of the next day, Wednesday, 29-August, was dedicated to helping Billy with a project aboard The Edge. 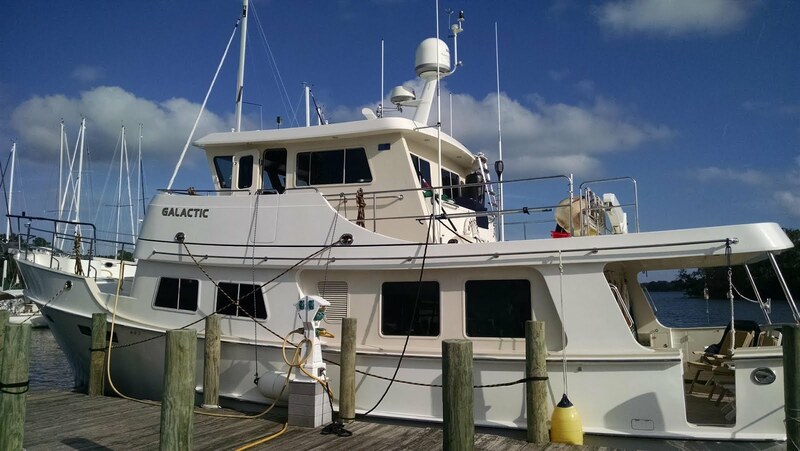 He had a rain water leak in the vicinity of one of the salon windows and suspected some hardware attaching one of the mast’s guy wires to the boat deck above. Like most boat projects it took us twice as long as estimated to remove, clean and re-bed the thing with 4200, but eventually we got it done. It was damned hot again, so the second half of the day was spent cleaning up, rehydrating, cooling off in the A/C, watching some baseball and updating the next blog entry. Billy also gave us use of his car (a very nice Audi convertible), so Michelle took advantage of that to run a few errands in town. That evening Billy joined us aboard Ghost Rider for drinks and dinner, and then some fly bridge time with a few more drinks. Billy brought a bottle of fine 2012 Chardonnay and a 15-year-old Macallan scotch, so it was destined to be a fine night. It was a beautiful if somewhat warm sunset, with Venus and Saturn brightly evident in the darkening clear sky, and just the right amount of breeze, boat stories and alcohol. Thursday, 30-August was another relaxed day on the boat at the Chesapeake Boat Basin Marina. Our Wheelhouse maintenance software was reminding us that the semiannual task of cleaning and lubing all deck hatch weather-stripping and gaskets was due, so Rick spent a couple hours tending to that; it isn’t a difficult job, but there are a lot of them…coating them all periodically with SuperLube can save a lot of headaches later. Chelle borrowed the marina’s courtesy car and headed into town to pick up some additional provisions, mostly fresh fruit, in anticipation of some extended anchorage time along the shores of the Chesapeake. The Chesapeake Bay is an enormous watershed, about 200 miles from end-to-end, and averaging 20 miles in width, but with over 11,000 miles of coastline when considering it numerous rivers and creeks feeding into the bay. For a contrast, the state of Florida has approximately 8,400 miles of shoreline…not bad for a single state, but you get the idea. Our general plan was to slowly make our way to Baltimore at the far northern end of the massive estuary by the last week of September. There we would attend the next Trawler Fest for several days of technical training courses. That meant we had a bit over three weeks to get there, plenty of time to relax and explore interesting places along the way. KK55 (Galactic) Docked Behind Us Where We Had Been Parked. So we had wanted to extend at least one more day at CBB, mostly so we could visit with Becky when she returned to The Edge from Richmond, where she had been caring for her twin sister. But the marina informed us another boat would be claiming our slip, so we made preparations for a Friday departure. But on the morning of Friday, 31-August Billy and the marina staff came up with an idea to move his boat forward and create just enough room for Ghost Rider to tuck in directly behind him….so that’s what we did. It was a bit snug and we lost some depth, but we still had just enough water at low tide. Place Ribbon. At $1400 Fortunately Chelle Did Not Buy It. After that Chelle got some pool time in the afternoon while Rick messed around with some minor chores and admin tasks and also sneaked in a nap. Later that evening we were treated to a visit with Billy and Becky’s family in nearby Kilmarnock, from where we also walked to nearby “Specials”, an excellent and reputed wine store. 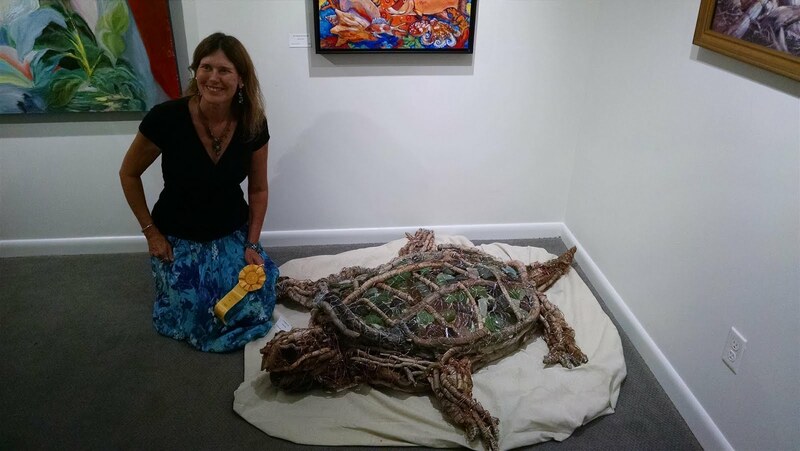 After a generous wine tasting session (and of course some purchases there) we strolled a short distance to the town’s small art gallery. We picked up a pizza and headed back to Ghost Rider for drinks and a late dinner with Billy and Becky to conclude a thoroughly enjoyable day. We were so enjoying our visit here – and the TRW forecast for Saturday, 01-September wasn’t appealing – so we decided to stay yet another day. Chelle and Becky did some more shopping in the morning, mostly at the local farmer’s market. Late in the afternoon our new neighbors on the Kadey-Krogen 55, Galactic, invited us over for a social over drinks and snacks. Mike and Dyan Warren are well known cruisers in the KK community, and not surprisingly we have several mutual friends in the Nordy community as well. We enjoyed drinks and snacks and they gave us a tour of their beautiful boat; the engine room and engineering spaces below are stunning – clean as a surgical operating theater and amazingly spacious even with twin John Deere diesels….two of Ghost Rider’s engine rooms would fit in there. Billy came by to fetch us that evening so we could all celebrate Becky’s and Emily’s birthday at Emily’s house with a great dinner party. Billy broke out another bottle of single malt scotch, and we thoroughly enjoyed visiting with Emily’s daughter Kelley and her husband Mike, along with their young son, Sam. The morning of Sunday, 02-September broke sunny, dry and warm. We weren’t in any kind of hurry since the length of our planned route for the day was under 50 miles, so we didn’t start up until just before 1100. Billy, Becky, Emily, Kelley and Sam all showed up to bid us bon voyage and they also helped us with the lines. We had to thrust sideways quite a bit to escape the tight space and avoid the stern of Mike’s KK55, but we managed that and backed out into the deeper part of the basin without incident. There was barely a hint of breeze and the bay and river waters were flat calm. An initial high overcast gave way to clear, sunny skies, and temperatures had moderated quite a bit to the low and mid-80’s. We bucked a mild tidal current the first half of the day, barely averaging 7 knots, but it was a very pleasant day for a slow cruise. We headed north and then cut to the northwest to enter the wide mouth of the Potomac River, then made our way into the St. Mary’s River, turning north again towards the Horseshoe Bend anchorage. After we dropped the anchor our first attempt at setting it resulted in some slow dragging, so we picked it up and motored a few hundred meters to the west, and on the second shot we got a good dig. By 1730 we were fairly well settled. The temps had edged into the low 90’s and the wind was still very light, so we cranked up the genset and got the A/C going. 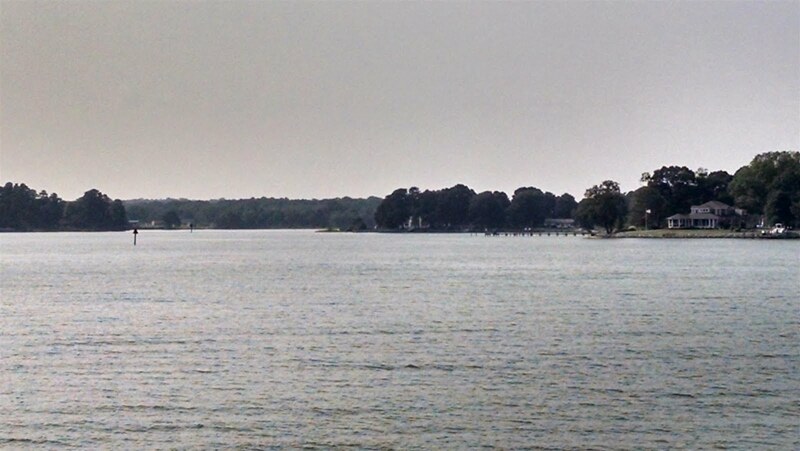 At this point we are about half way up Chesapeake Bay, but detouring a bit to the west. We’re going to hang out here for at least another day to launch and exercise the tender, and check out the nearby shorelines for potential areas of further exploring. We will likely head further up the Potomac after that before returning to the bay and the journey north to Baltimore. ➧ The new fuel sight gauge assembly required some tweaking....you don't really know for sure whether it will seep until you go several days, and some (very, very slight) tightening of upper and lower securing nuts is typically required; it appears we finally found that sweet spot. ➧ The new steering ram is doing its job; the upper (fly bridge) helm station feels a little stiff, but likely is just a tighter system now without that leak around the piston seal. ➧ Speaking of the new steering ram, remember that leftover mysterious / suspected hydraulic leak Rick was trying to find? Well, when clearing out the laz to make room to work on the steering we found a gallon of motor oil and a gallon of ISO 68 hydraulic fluid leaking from bottom cracks in the plastic bottles....eventually it would run and pool up in other strange places beneath the lazarette floor hatches. ➧ We were actually able to get the old ST60 wind instrument working again. The Raymarine tech had told us the control head was bad & would require replacement after we verified the transducer voltages were good. But Rick decided to also check the head's rear connectors and found some corrosion and one wire that came off in his hand; after cleaning and crimping in a new bayonet connector the thing came back to life. ➧ We still have a minor oil leak at the front of the main engine. Rick dismantled all the belt and engine guards to take a closer look while we were underway and determined the source is likely the crankshaft front oil seal (and not the oil pan gasket this time.) For now we're going to monitor & measure the rate of leak; at some point we'll engage a diesel mechanic to have that seal replaced. Come see us....the weather here is a lot better than yours -- at least for now.